Comet Lovejoy streaks through the pre-dawn skies above the European Southern Observatory's Paranal Observatory in Chile on Dec. 22. If anyone questioned whether Comet Lovejoy would become the star of the season — and a lot of people did — the pictures of the past few days have removed any doubt. In the Southern Hemisphere, the death-defying comet is truly this year's "Star of Wonder." Not only do we have an amazing video of the long-tailed iceball rising from the horizon, as seen from the International Space Station, we also have the stunning pictures and video released today by the European Southern Observatory. 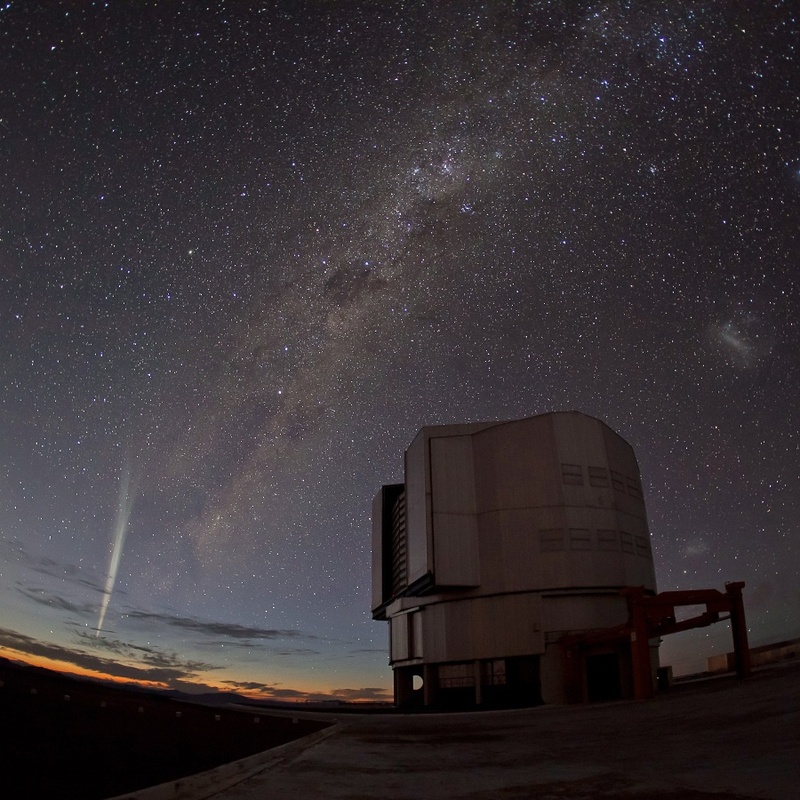 Skywatchers at the ESO's Paranal Observatory in Chile captured the comet against the glittering backdrop of the Milky Way. "For me, this comet is a Christmas present to the people who will stay at Paranal over Christmas," said Guillaume Blanchard, who snapped a picture of dawn at Paranal with the Milky Way and Lovejoy dominating the sky. Gabriel Brammer put together a time-lapse sequence of the comet rising just before the sun. For devotees of the night sky, it's the latest must-see video. The clip also features the pencil-thin laser beam that Paranal's Very Large Telescope uses as a guide star for its astronomical observations. Expand the video to full screen to increase the awesomeness. "With this spectacular sequence of the 2011 Christmas Comet Lovejoy, ESO would like to wish everyone a Merry Christmas and a Happy New Year," the observatory's staff says in today's image advisory.